At the jobette, we feature a local artists each month. On the first Friday of the month, shops and art galleries stay open late, and in the summer, that’s when the farmers’ market is open downtown. So it’s pretty festive. This month, our artists were a group of women who immigrated from Mexico. They live in a wine-making valley, and together they learned to read, speak English, and quilt. They call their group “Los Hilos de la Vida”, or “The Threads of Life”. Their quilts are remarkable. A woman after my own heart. There can’t be too many people who bring their cats on a journey like that! I’m not sure how she managed to transfer the wrappers from cigarettes and candy bars to the fabric, but it’s an amazing effect. She also has tiny wheels and other found objects. 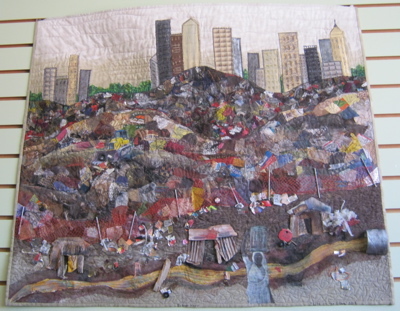 This part of the quilt represents the garbage piles in Mexico City – the city itself is in the background – where people live in huts. This is what she left behind to come to America. I love it that these women came together to help and strengthen each other, to learn and grow together, and to tell their stories in such a beautiful and moving way. 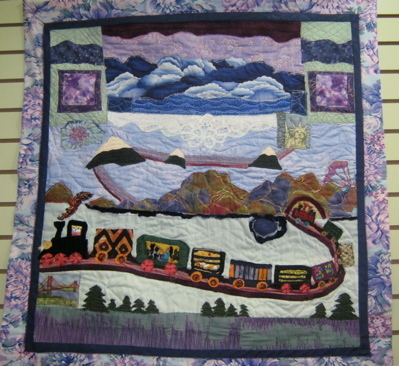 It is nice to see that some people are still telling their stories through quilts and other means. Our ancestors were renowned for doing so, thanks for sharing.